12/April/2013 – Is all well with the Friary Outer development? Thank you to Lichfield District Council for providing an update in the Apr/2013 posting to the Friary Outer Development blog. Reading between the lines it appears that the hotel construction phase follows the Parking lot/Affordable homes phase. Not sure when the plan was switched from parallel to serial development, but it does explain the delay. We have asked our local councillor & BSARA member Terry Thomas (District Councillor for Chadsmead ward) to investigate. The last news update posted to the District Council's Outer Friary blog on 13/Mar/2013 gives no indication of problems. 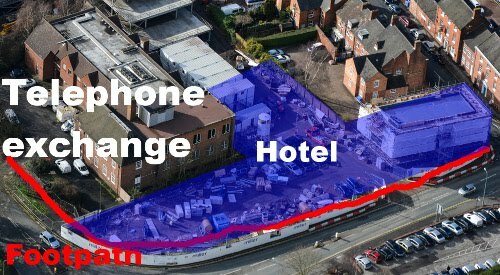 The photo to the right, taken on 14/Feb/2013, indicates the approximate position of the footway in red and the approximate footprint of the hotel, restaurant and retail unit in blue. It is clear that there is much work to be done in this area. We trust that the District Council will follow through on commitments given after the Heritage Parks upgrade fiasco, namely that in future the the Council will do a better job about keeping the public informed.